A sword has been retrieved from Dozmary Pool in Cornwall by a 7-year-old girl who was paddling in the shallow water near the edge. Local folklore has it that this was the very lake where the legendary Excalibur was thrown by Sir Bedivere after the Battle of Camlann and King Arthur’s death. Might there be any truth in the legend and is this the lake? Mathilda Jones was holidaying with her family in Cornwall and her father recounted some of the legend of King Arthur story to her and her 4-year-old sister Lois, as they traveled to Dozmary Pool, a small lake on Bodmin Moor, a designated Area of Outstanding Natural Beauty, in Cornwall, in the south-west of England. The Pool itself was designated a Site of Special Scientific interest in 1951 due to its biological significance. It is also a site of special mythological interest, due to its supposed connection with the legend of Excalibur. It was whilst wading waist deep in the pool in order to cool off that Matilda came across the find. According to Matilda’s father, Paul, as reported by The Scotsman , “It was a blistering hot day and Matilda asked if we could go for a paddle. She was only waist deep when she said she could see a sword.” When the sword was removed from the lake, it was seen to be about 4 feet in length and certainly not from antiquity, let alone having legendary traits. Paul said, ‘I don’t think it is particularly old, about 20 or 30 years old. It’s probably an old film prop,” reported The Scotsman . After the holiday, the family took the sword back to their hometown of Doncaster where it now serves as a great prop for Matilda’s best story to date. The legendary tales of King Arthur are known throughout the world, and the recent film, King Arthur: The Legend of the Sword will do more to spread the tale. But is there any real-world truth to the legends? Arthur remains only as a legend because there is a distinct lack of contemporary evidence of his existence. No inscription or historical documentation, or any archaeological find from the period in question has been uncovered bearing the name of Arthur. However, this is not proof that he didn’t exist, as few written records from this time have survived. According to a previous Ancient Origins article , the historical character on which Arthur is based is first recorded in the 6 th century by the Welsh Monk Gildas in his De excidio et conquestu Britanniae (Of the Ruin and Conquest of Britain), although here he is not named. In the ninth century, however, Nennius, another Welsh monk, writes in A History of the Britons , that Arthur led and was victorious against the Saxons in 12 battles. Then in the tenth century Annales Cambriae (Annals of Wales) Arthur is mentioned as the victor against the Saxons at the Battle of Mount Badon in 516, and Arthur and “Medraut” are mentioned fighting at the Battle of Camlann in 537. It seems that these records are of the real-life character on which the legends were built, developed and have been retold to this very day. 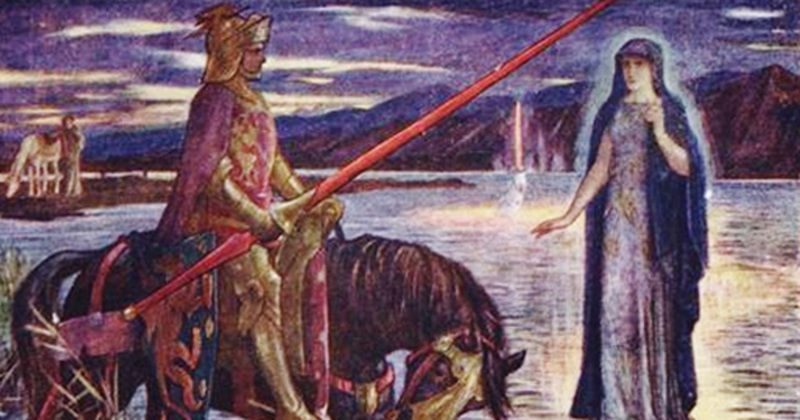 The Excalibur legend claims that Arthur was taken to a lake by Merlin and here he was given the sword Excalibur by a water nymph called the ‘Lady of the Lake’. It is a completely different weapon and should not be confused with the one which he drew from the stone, thus displaying his right to the throne of England. No, Excalibur was a special weapon gifted by the Lady of the Lake and when Arthur was fatally injured in the Battle of Camlann, he returned to the lake in an attempt to give the blade back before he died. 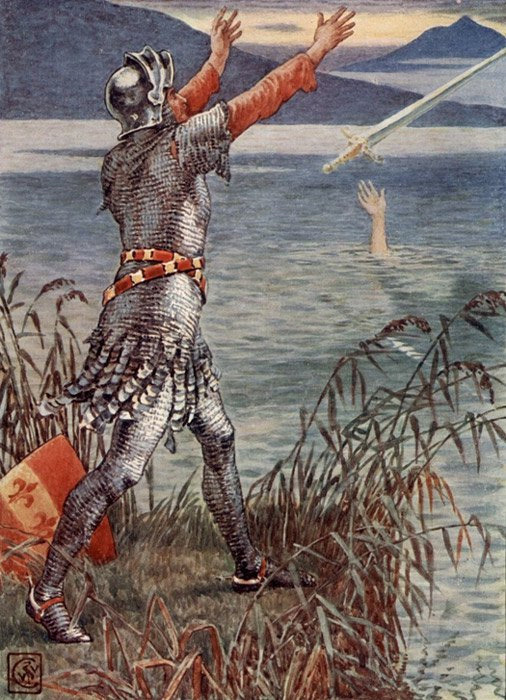 After failing tree times to cast the sword away, Arthur was eventually aided by Sir Bedivere, who threw Excalibur into the lake and it was taken by the hand of the lady. According to an earlier Ancient-Origins article , this story has some founding in reality, as the practice of throwing swords and other weapons into lakes was of Celtic origin, and served as an offering to a goddess. Is There a Resemblance with the Sword of Legend? The obvious modern look and crude manufacture of the sword found at Dozmary Pool makes it pretty obvious that the sword is not from the 5th 6th centuries, the time in which Arthur’s legends are based. But apart from that, it is immediately evident to those with expert knowledge that this sword could not be Excalibur. At 4 feet long, it is just too long to be of the correct type used. According to Graham Phillips , author of The Lost Tomb of King Arthur , at this time, a short sword of the type used by Roman cavalry would have been used in Britain and so a long sword of the type found would be totally out of place and time. Could Dozmary Be the Legendary Lake? It is local folklore that Dozmary is the lake where Excalibur was discarded and the idyllic setting certainly suits the image aroused by the legend. 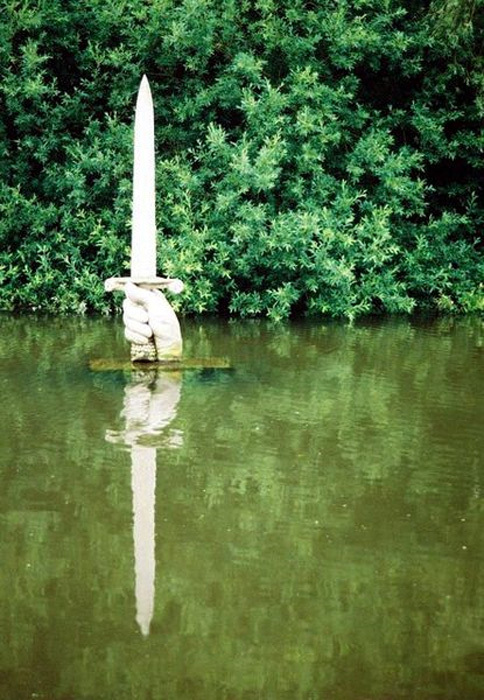 Might the real (legendary) sword Excalibur still lie in the depths of the lake? From the stories, it seems that the likely place for the Lady of the Lake scene was the lake surrounding the Island of Avalon, where Arthur went to heal and eventually die. Dozmary has no such island. Also, Arthur is said to have died after the Battle of Camlann, and although the location of this battle is unknown, it is doubtful that it took place in the beautiful but remote moorland of Bodmin. Perhaps a final doubt is cast due to this lake being relatively shallow (the clue being in the name, as it is referred to as a ‘Pool’ and not a ‘Lake’). Although rumored to be bottomless, this was proven not to be the case by droughts in 1859 and 1976 which dried it out completely. With these factors taken into account, Dozmary Pool’s claim does seem somewhat weakened but with the whereabouts of the legendary lake not on record it still remains one of the possible contenders. Glasney College may have created a miracle play in the name of Arthur,as we Cornish liked our drama but thanks to someone destroying Glasney College and nearly everything in it, that route probably won’t lead anywhere. Read more about Where did King Arthur Acquire Excalibur, the Stone or the Lake?